Hello friends! I am excited to get my link up for the ornament exchange up a day early! I have had such a busy week. Wednesday night the hubby and I went to pick out our Christmas gifts. We had already decided to get a new large screen TV and a new laptop. I found great deals at HH Gregg, so we went and picked them up and now I am trying to figure out how to operate this new laptop with Windows 8! A tad bit confusing, but I am getting there! Last night was our Christmas Program at school and I was miserable when I finally got home last night. I was so sick, but went to bed early and woke up feeling much better...thankfully! Anywho, as promised, here is a link up poat so we can all see the treasures you received from your partners. I sent a package to Karen at The Feral Turtle and I received from Terri, a new blog friend from Christmas Tree Lane . She sent me some lovely things! I also received a box of goodies from my blog buddy Donna from Distressed Donna Down Home and I will share those as well. Terri sent me a lovely handmade card. This was the sweet little post-it note inside! She also sent me this adorable Spode snowman ornament. And this little cutie too! I love angels and snowmen, so this is the perfect combination....a snow angel. Here she is on the tree.....I just love her wings! A sweet Christmas apron...sorry for the blurry photo! A sweet little crocheted piece with candy canes inside. It hangs and is open like a pocket to tuck treats inside. Donna is such a sweet friend. Last year and again this year she sent me a box of goodies as a thank you for hosting the exchange. I was surprised to receive a box again this year...:) Look at the sweet wrapping on these treasures. I love Donna's distressed tags! And her bleached bottle brush trees! Aren't these handmade Santa's cute? Here they are displayed in a couple vintage Pepsi bottles in my bookcase. I loved these Shakes of Christmas when she shared them on her blog, so imagine my delight when there was one included in my box! Donna is all about details. The biggest surprise was these beehive bobbins though! 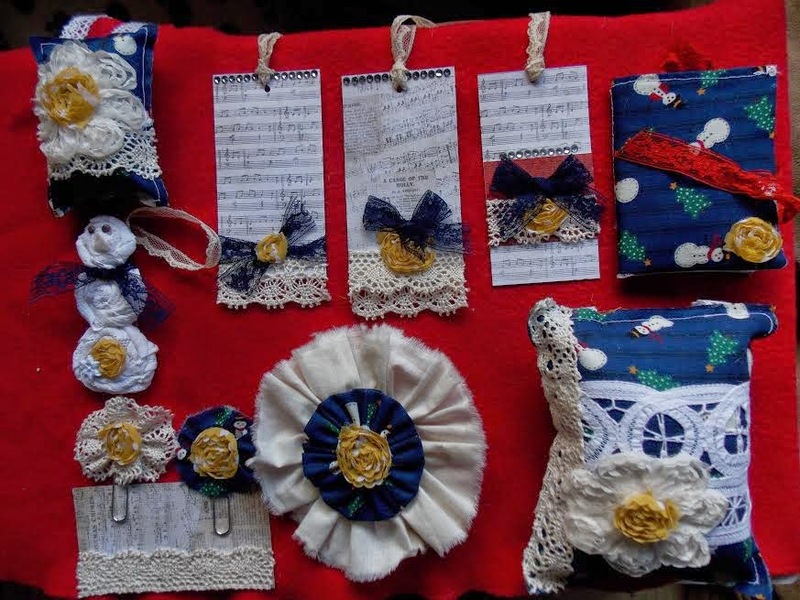 She had shared these on her blog and I commented about how neat they were and I had never seen any. Donna knows I have a subtle bee theme in my dining room and she said these were intended for me all along. She is such a dear friend. So thoughtful! I love how she dressed them with vintage images for Christmas. She also sent me some vintage Christmas postcards that I turned into a banner along with a couple I already had. Thank you again Donna! You are such a dear friend. "I received Carol’s package on Nov. 24th. She sent an adorable little stuffed snowman, a heart ornament she fashioned out of wire, a tiny white clothespin with a Christmas tree attached to it and a journal/notebook. Also included was a glittery Eiffel tower tag. The journal was tied with a red polka dot ribbon and things were packed into a red polka dot bag and a stamped muslin baggie---very cute!" Sweet Belle from Australia has been out of town, so I just updating now with her information. "My sending lady was Linda Pflum. However I received a lovely vintage style pair of handmade wooden mitts which are so sweet and I think maybe I might even use them during the year and not just at Christmas time as they are adorable. 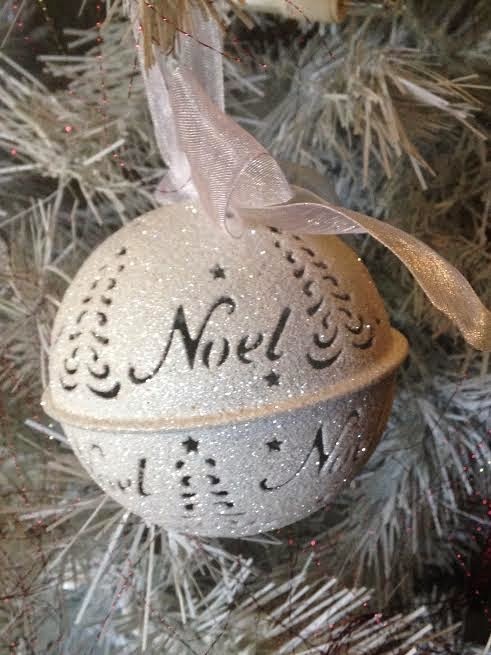 Along with the mitts I received a sparkly white very Christmas' bauble that goes so well in my white sparkly tree. This was all wrapped up nicely in red sparkly tissue paper that I found enchanting to be honest and a lovely hand written card and little notebook and pen which is now in my drawer to be used by all my girls im sure once they find it." These three ladies were blessed to receive such sweet ornaments from some special ladies. Thanks to each of you for sharing your beautiful gifts. 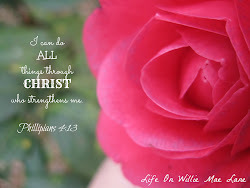 All of you sweet ladies are such lovely friends and I am blessed to "know" each of you. I can't wait to see the lovely things you received. Thanks to each of you for participating. The link button appears after my signature below. Be sure to link up your post when it is ready. I hope you were as blessed as I was with the exchange. My dear Vicky, thank you so very much for hosting this exchange - I have once again been blessed by you and the women I was paired up with. I truly appreciate your hard work in arranging everything - you are a dear! The items you received are simply delightful. Those Santa's are so cute! Donna is one talented lady :) And the sweet snowmen are quite charming. Thanks again! Also, will there be a link up? I am not seeing it on your blog... Happy weekend to you! Hugs! Thanks so much for hosting Vicky, I'm looking forward to seeing everyone's goodies! 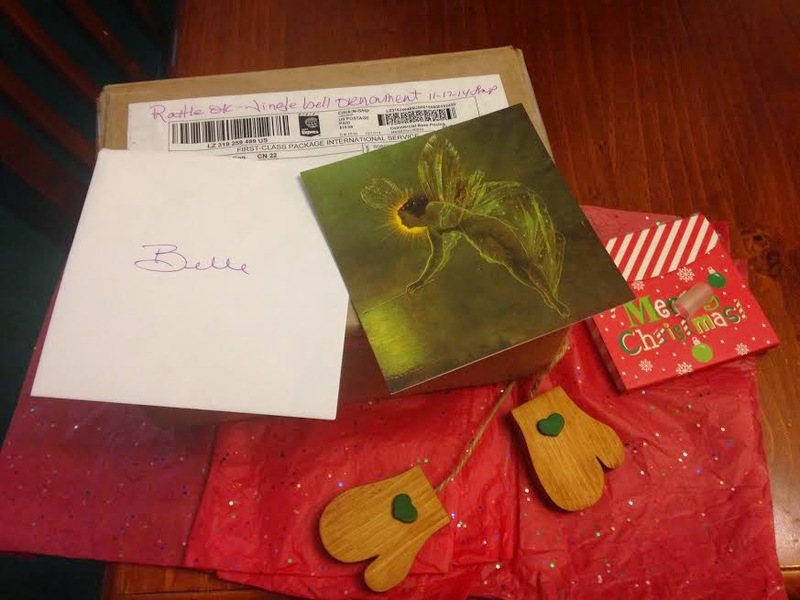 Vicky, you are one of the sweetest ladies in blogland and I'm so glad I was able to join in for the 2nd ornament exchange. You received such cute things and perfect for you. That Donna is a special gal for sure. Wishing you a Very Merry Christmas! You received such lovely goodies Vicky! This has been such fun, and you did a fabulous job arranging everything. I was so glad to take part again this year. Donna's Santas always make me smile. Congratulations on another fabulous ornament exchange Vicky! I know it's work to do this, but your rewards are great! You got such pretty treasures this year! I must get my hands on some of Donna's Santas! I love those silly things so much. Thank you so much for hosting this fun exchange and now the link up. This was a lot of fun. Wishing you a very Merry Christmas, Vicky! Another very successful and fun ornament exchange. I love all my goodies from Tina. I am so glad you and Tania enjoyed the Christmas boxes of vintage things. I will be back to look at more links tomorrow! Thanks, Vickie, for hosting and organizing this exciting ornament exchange! You did a superb job! I had so much fun and what better way to help spread holiday joy. Vicky this was so much fun! Thank you so much for coordinating all of this. You went above and beyond and thank you again for all of my wonderful treasures. New keepsakes for my tree......except I am wondering where those pecans are??? LOL Have a wonderful weekend! WOW, you got fantastic packages. I've looked a few links, so much creativity and generosity. I've linked up and am looking forward to visiting all the links. I'll be back to visit all the links later today. Hi Vicky, thanks so much for the fun ornament exchange. I had a great time and I look forward to next year's exchange. I love al of your ornament and goodies you received. Wishing you and your family a Merry Christmas! Hey Vicky, I'm sorry I'm so late to the link up! It has been crazy around here this weekend. All the ornaments and goodies everyone received are SO beautiful. I tell you, all of these ladies are so generous. It has been a privilege to be a part of this exchange. Thank you so much for hostessing this again this year! Thank you so much, Vicky! It was so much fun and I just love being a part of this. I hope you are having a wonderful weekend. You are a sweetie to open this up to us ladies.